François Ozon’s adoration of the power and complexity in women is infectious. In this gloriously light comedy about matriarchy, Catherine Deneuve is the resplendent Suzanne Pujol, the ‘potiche’ (trophy wife) of Robert (Fabrice Luchini), archetypal 70s businessman and director of the family’s umbrella factory – a neat wink to Deneuve in the 1964 The Umbrellas of Cherbourg. Robert is a chauvinist, unsympathetic to his workers and has a number of mistresses. Suzanne, on the other hand, is the ‘image of the wife and mother believed to be beyond reproach.’ Or is she? She has her garden, her kitchen appliances and her little black book in which she writes her poetry. Ozon, just as in 2014’s Une Nouvelle Amie (The New Girlfriend), directs Potiche with a shimmering kitsch. He is the fairy in the forest that points the wand and ‘ping’: each scene sparkles with sweet-shop vibrant hues, and joyful, feathery performances. Aside from brief flickers of pain, bottled disappoints with an old lover or her irritating husband, Suzanne is triumphant in her matriarchy and her sexuality. Deneuve plays Suzanne with an intoxicating, giddy optimism, frequently claiming ‘C’est beau, la vie.’ She treats the workers as ‘her children’, and they are happy; and she is gentle, but firm, with Maurice Babin (Gérard Depardieu), an old flame and the town’s ‘communist’ mayor, and he complies. Yet, despite her self-control, Suzanne can still appreciate the sexual appeal of a truck driver who picks her up from the roadside, and gives her a ride. Her imagination is as strong as her will, and her husband watches, with pathetic surprise, as his ‘potiche’ topples, wrapped in splendour, from the mantelpiece. 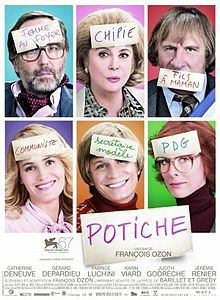 This entry was posted in François Ozon, Matriarchy and tagged Catherine Deneuve, Fabrice Luchini, François Ozon, Gérard Depardieu. Bookmark the permalink.